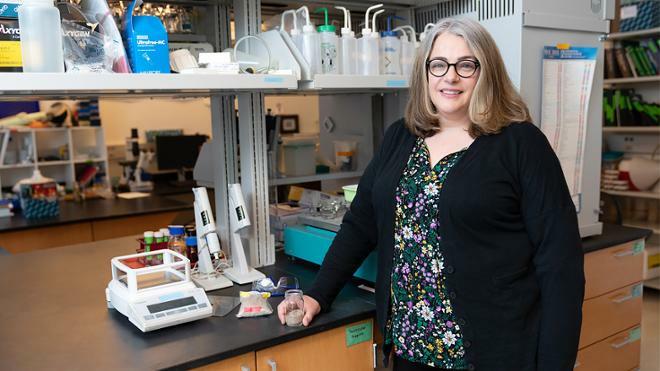 Amy Treonis, an associate professor of biology, has received a Fulbright Scholar award to support ten months of teaching and research at the University of Namibia in Africa. Treonis studies soil ecology, and while in Namibia, Treonis will research nematodes, an understudied group of microscopic organisms found in soils and sediments. As part of her award, she will teach courses in the University of Namibia’s Department of Integrated Environmental Science and complete a study of soil nematode ecology across microhabitats in the Namib Desert. The ecosystems she will focus on include fairy circles, which are circular patches of barren land surrounded by grass growth. For decades, scientists have been studying these complex ecosystems, which are only found in the Namib Desert and in parts of Australia, to try to determine why they occur. “This award allows me to integrate my scholarly passion for desert ecosystems into teaching environmental science to the next generation of Namibian scientists,” Treonis said. Treonis has taught at the University of Richmond since 2005. She completed her Ph.D. in ecology at Colorado State University and her undergraduate degree in biology at Dominican University. She was previously awarded a Fulbright Scholar and Visiting Lecturer position at Kathmandu University in Nepal. The Fulbright program, which aims to increase mutual understanding between people of the U.S and people of other countries, is overseen by the U.S. Department of State. Grants are made possible by funds appropriated annually by Congress along with contributions from partner countries and the private sector.